Pegasus, an Ashfield company, part of UDG Healthcare plc, has unveiled a new brand identity signaling its successful integration with the global business, a year on from acquisition. Conceived by Pegasus’s in-house creative services team, the new look now lives across its internal and external channels. The new brand is just one part of the agency’s continuous evolution. 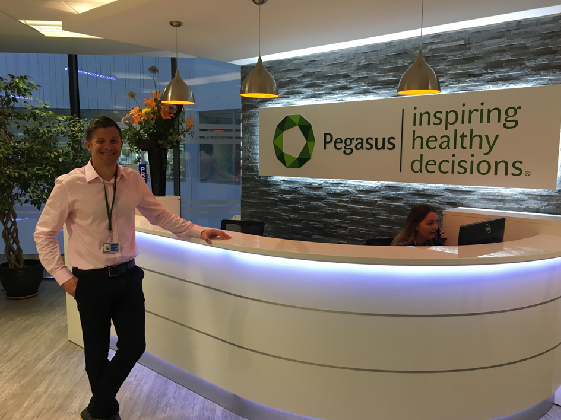 Fixed on its course to inspire healthy decisions through creative integrated communications, Pegasus has built a team of 110 people working with a ‘health first, sector second’ approach. The agency’s capability now spans research & insights, strategic planning, media & influencer relations, creative services, digital & social marketing and corporate services. Its swift growth has led to the opening of a new office in Macclesfield to capitalise on talent recruitment and business development opportunities in the North, as well as being able to work more closely with other Ashfield teams. And Pegasus hasn’t stopped innovating either. Earlier this year, Pegasus launched its bespoke framework for planning in health (CHANGE) which uses behaviour change theory to add greater rigour to its strategic consultancy, and has been developed in collaboration with UCL’s Centre for Behaviour Change. It has also invested in its creative team and last year was shortlisted in the Cannes Lion Health awards. In the last 12 months, Pegasus has received five ‘Consultancy of the Year’ titles across global markets and disciplines.